It's a 4 player game (2 pairs), that uses a standard 52 card pack, 13 cards are dealt to each player. The object is to score more points above the line. Bidding - before the match starts a bid is placed and specifies the number of tricks and the trump suit. Trick - It's where to place a card on the table, whoever has the highest card wins the trick. Dummy - Player that doesn't play the round, he must show off his cards for everyone to see and it's his partner that plays his cards. Line - This line appears on the score represented by a double line. The points listed below the line represent the points of the match, the points listed above the line represent the points of the whole game. Vulnerability - When a partnership wins a match they will be vulnerable for the next round. The game is played in a best of three matches. At each round a dealer is chosen. The dealer deals out the 52 cards one at a time until all 4 players have 13 cards. Then it's time to start the bidding. Turn to deal rotates clockwise. Right after the dealing, the bidding starts being the dealer the first one to bid. 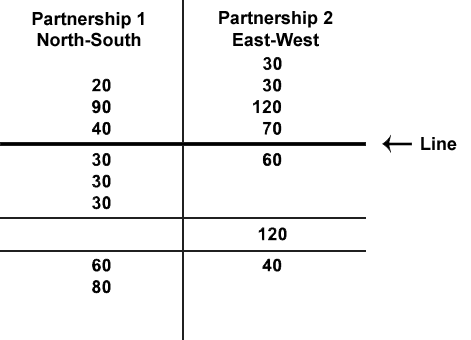 The bid specifies the number in excess of 6 the partnership must have to win. You can bid the numbers from 1 to 7, it means that if you trick bid 1 you are estimating that your partnership will make 7 tricks. The same way if you trick bid 7 your partnership will have to make 13 tricks. Besides the number of tricks, you must bid which will be the trump suit or if that there will be no trumps. If a bidding is made with a trump suit, the 4 of hearts for example, any card of hearts will win any card of all the other 3 suits. If you think you don't have good cards, you may pass your turn. You can double the bid, that will worth twice the points. If the bid has already been doubled, the player may redouble it and it will worth four times the points. At the example above West started bidding that his partnership would win 9 tricks (6+3) with diamonds as trumps. South, assuming that they wouldn't win 8 tricks, doubled the bid. East canceled North-South bids and bid that she would win 10 tricks with hearts as trumps. West raises the bid and that his partnership will win 11 trick with the same suit as trumps. South, East and North passes. If the 3 following players to the player that bid pass, the bidding ends. If any of the 4 players bid, a new round is started. At the example above East was the auction's “declarer”, for playing the hearts suit first. Therefore the player on its left, North will begin the game. The round's dummy will be West. North starts the round being able to play any card from his hand, after that West's cards are exposed for all the players at the table and East will play for him. Each player has to play a card from the same suit of North's card. If a player doesn't have that suit, he can play any card. Wins the trick the card with the higher value and who won the last trick begins playing a card on the table. Cards values order from higher to lower: A(Ace), K(King), Q(Queen), J(Jack), 10, 9, 8, 7, 6, 5, 4, 3, 2. At the last play, South will win the trick, because it played the rounds trump suit, hearts. The game goes on until one of the teams wins the most tricks out of 13. At the end of every match the points of each team are shown. The game is played in a best of 3. In a match the team with 100 or more points below the line wins the match and a new one begins. The game ends when one of the teams wins 2 matches. The team that wins a match will be vulnerable at the next match and the team that didn't win a match won't be vulnerable. A team when vulnerable is subject to higher bonus or penalties to its scores. - In case one of the teams covers the doubled contract, they wins 50 points above the line, those points are called “50 for the insult”. If a team covers a redoubled contract, they win 100 points times 50. If a partnership wins more tricks than were bid, they will score bonus points above the line. If the trump suit is Clubs or Diamonds, it will worth 20 points for each trick that exceeds the bid. If there is no trumps or the trump suit is Hearts or Spades, it will worth 30 points for each trick that exceeds the bid. Redoubled undertricks cost twice as much as doubled undertricks. North-South won the first match scoring 90 points below the line. East-West scored 120 points below the line in 1 round and won the second match. North-South won the last match so the game ended. Despite winning two matches, North-South don't win the game because they scored 150 points above the line and East-West scored 250 points above the line. Therefore, East-West wins the game. Amplify your knowledge at Card Games reading the rules and watching videos from similar games to Truco Mineiro .